Will Turkey remember the Syrian citizenship debate? It was on 2 July 2016 that President Recep Tayyip Erdoğan announced that Syrian ‘guests under temporary protection’ (i.e. refugees) in Turkey would be granted Turkish citizenship. He deferred to the Interior Ministry for further comment, though members of the government themselves seemed to have been taken by surprise. The proposal sparked immediate debate in the political arena and on social media, with not only opposition parties speaking against it but even grassroots supporters of the Justice and Development Party (Adalet ve Kalkınma Partisi, AKP). Over one week after the statement, Deputy Prime Minister Numan Kurtulmuş said that the Interior Ministry had ‘not yet completed the work on the issue of giving citizenship to Syrians.’ It became clear at this point that not all Syrian refugees would have been eligible to acquire Turkish citizenship but only ‘qualified and educated Syrians with a clean record’. The estimated number was around 300,000. Then, on 11 July, Erdoğan detailed his proposition, saying, ‘there is no need to hesitate’ and that Turkey was big enough to welcome Syrians as citizens. As discussions concerning how Erdoğan’s proposal would affect Turkish society, economy, and politics were taking place, tanks and soldiers appeared on the Bosphorus Bridge in Istanbul on 15 July. Alongside the coup attempt, the citizenship grant to Syrians became a somewhat irrelevant ­– if not totally forgotten – topic. Five months have now passed, and officials have not brought up the issue again. Meanwhile, the war in Syria continues, with Turkey actively involved in the ongoing Operation Euphrates Shield and hosting close to 3 million displaced Syrians. In considering whether or not Erdoğan or the AKP will bring back the Syrian citizen grant proposal in the near future, we must discuss the reasons why President Erdoğan came up with such a proposal in the first place. At the time, it seemed evident that the government had not developed a clear policy. Erdoğan presumably aimed at strengthening Turkey’s humanitarian image, in more or less explicit contrast with the EU’s unreceptive stance towards refugees. The alleged ‘open door’ policy that Turkey adopted in the Syrian crisis has been recognised as laudable, yet can also be criticised as a self-legitimising tool in the face of the EU’s condemnation of the breakdown of Turkey’s democracy. Part of the government’s narrative was also directed towards preventing the brain-drain of those most qualified Syrians, who would easily resettle in North American countries and Europe. When the proposal was first introduced, one of the main criticisms from international media was the potential effect that such a policy could have had on the EU–Turkey refugee deal. However, with the current state of Turkey–EU relations, it seems unlikely that visa liberalisation for Turkish citizens will happen in the near future. So if the Turkish government does look into the Syrian citizenship proposal again, it would most probably disregard external constraints and criticisms. Ankara would feel released from international commitment and would deal with the issue from a primarily domestic perspective. 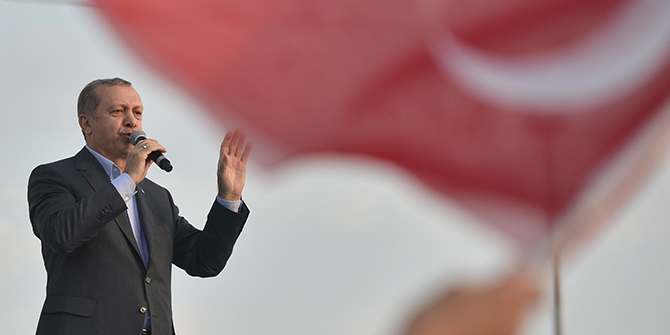 On the domestic side, arguably – and as most of the opposition parties claimed – granting citizenship to Syrian refugees would have served Erdoğan’s electoral interests. Reinforcing his image as the welcoming leader of the Islamic world and granting voting rights to a mainly Sunni constituency would have a strong impact on the electoral balance, especially with potential change in the Turkish constitutional system to come. It has been noted that some Syrian refugees would have been automatically eligible to seek Turkish citizenship once they had completed five years of continuous residency in Turkey. With this deadline approaching for the earliest arrivals, Erdoğan’s proposal would have served to cover a default procedure with an aura of exceptional humanitarianism. The personalisation of such an important issue as the citizenship grant would put Erdoğan in the favour of those eligible to acquire Turkish nationality. Erdoğan also suggested that Syrians would be given unoccupied houses built by the Housing Development Administration of Turkey (TOKİ) as part of a ‘zoning and employment policy.’ Arguably, this was both a sociological and an economic policy, since he also considered taking TOKİ to Syria for massive house and social facility building. The People’s Democratic Party (Halkların Demokratik Partisi, HDP) was particularly critical of such policies, accusing the AKP of economic speculation and the intention to modify the demographic structure of predominantly Kurdish areas. Alevis also accused the government of purposefully settling Sunni Syrians in Alevi regions such as Kahramanmaraş and Tunceli (Dersim). The motivating factors that underlined Erdoğan’s proposal are still valid today, and are perhaps even more relevant, given that Turkish citizens are likely to vote in a referendum in April 2017. However, there is one major change that may make Erdoğan reluctant to put this issue back on the agenda: the worsening economy. Since the coup attempt, Turkey has been struggling with security concerns, both internal and external. Moreover, in the third quarter of 2016, Turkey’s economy contracted for the first time in seven years. Considering that even the AKP’s electoral supporters were previously opposed to Erdoğan’s proposal to grant citizenship — and thus equal civic rights, working rights and free housing — to Syrians, resurrecting the proposal under the country’s present conditions may elicit a broader, more negative reaction from the public. Erdoğan’s statements have most likely been nothing more than a ‘trial and error’ strategy for the purpose of testing public response. Since the AKP constituency reacted negatively to it, it seems less probable that the topic will be brought up again. It is crucial to note, however, that Erdoğan is a leader with a great ability to shape public opinion. If he decides to put this issue back on the table, he would find ways and tools to make his argument convincing. Francesca Capoluongo is a graduate student at the School of International Studies, Master’s in European and International Studies, University of Trento. She graduated with a Double Degree in Sociology and International Studies at Technische Universität Dresden and at University of Trento. As a graduate student, she has been studying and researching in Istanbul, where she has been working as an intern at Istanbul Policy Center. She is currently conducting research on Turkish university students’ perceptions of Turkey and EU’s policies towards refugees.